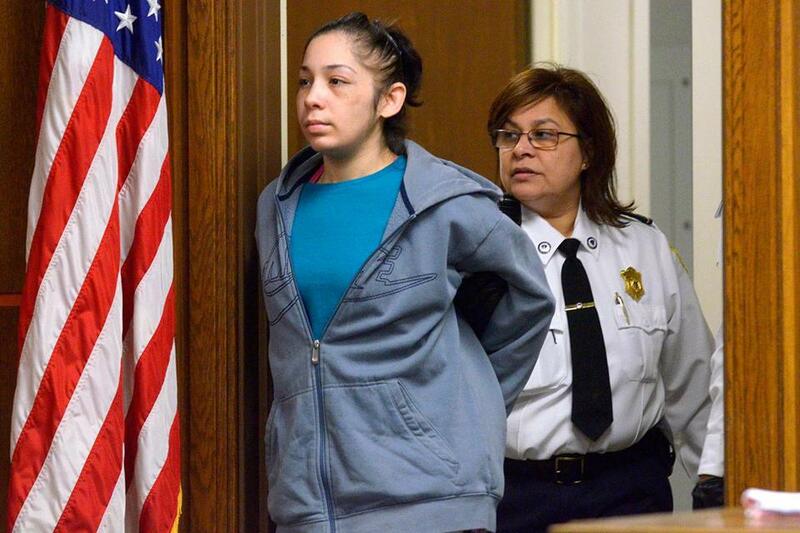 Elsa Oliver — mother of Jeremiah Oliver, 5, who is feared dead — entered district court in Fitchburg for a hearing in January. She faced charges of reckless endangerment of a child. Massachusetts is used to being near the top in national rankings — from education to health care to technological innovation. But when it comes to protecting children in foster care or potentially abusive homes, the state has languished closer to the bottom for years, according to an assortment of federal data. 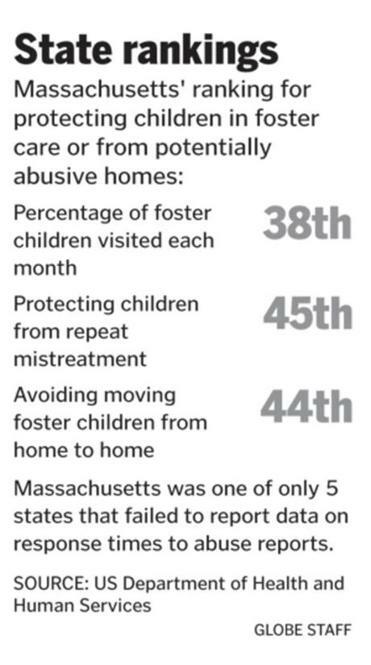 Massachusetts ranked 38 out of 50 states in the percent of foster children visited each month by caseworkers, according to 2012 data from the US Department of Health and Human Services, the most recent data available. In the category of children not mistreated again within six months, the state ranked 45th. On response times to abuse reports, Massachusetts was one of five states that failed to report the data to the federal government. The statistics are not a perfect measure of the state’s relative standing, as Massachusetts officials readily point out. But the state’s overall performance adds up to one of the worst in the nation, according to two watchdog groups that analyzed the federal results. One of the two, the Foundation for Government Accountability, a conservative research group in Florida, listed Massachusetts in 2012 as 50th out of 50 states because it fared so poorly in so many categories. The recent disappearance of Jeremiah Oliver — the 5-year-old Fitchburg boy who is feared dead after a state social worker failed to visit his allegedly abusive home for almost seven months — exposed flaws that critics say have been clear for years in the state’s troubling child protection reports. Massachusetts caseworkers missed nearly one-fifth of the mandatory monthly home visits last year, according to a report last month by the Office of the Child Advocate, raising concerns about the safety of the other 36,000 children under the agency’s watch. Massachusetts officials, and some researchers, reject the idea of using the federal statistics to compare one state to another, because different states sometimes use different standards to compile the data. For instance, Patrick administration officials pointed out that Massachusetts requires less proof than most other states to substantiate a report of abuse of neglect — boosting the number of local children who appear to have been repeatedly mistreated. And Massachusetts officials say they suspect the state suffered in the national rankings because they probably provided skewed data to the federal government themselves for years. In particular, state officials believe they underreported the percentage of children visited by caseworkers each month, while overstating how often children are moved from foster home to foster home. The Florida research group downgraded Massachusetts in its national rankings in part because the state failed to report some data to the US government altogether, specifically how long it takes to follow up on a report of child abuse. Massachusetts officials said their computer system does not capture enough information to calculate how long it takes to meet with someone who can provide information about the allegation — even though 45 other states provided the data and the federal government asks Massachusetts for the information every year. But critics say the state’s faulty data reflects badly on the management of DCF while making it harder for the Commonwealth to protect its children. Massachusetts caseworkers are so often late reporting visits that supervisors cannot tell whether workers missed a visit or simply have not gotten around to entering it into the computer system, according to one DCF manager, who spoke on condition of anonymity because she was not authorized to speak to the news media. The manager said it often takes the state six weeks to distribute the data to supervisors, compounding the problem. “It just makes it more difficult to enforce when you know some missed visits are not really missed visits,” she said. Child Advocate Gail Garinger, who is charged with investigating problems at DCF, said the state lacks some important data and does not have the resources to analyze the data it does collect to identify and fix problems. “We really do not have state-of-the-art technology,” Garinger said. Officials in neighboring New Hampshire — which placed second in the Florida organization’s national ranking of child welfare — say they pay close attention to collecting and reporting accurate data. Maggie Bishop, director of the Division for Children Youth and Families in New Hampshire, said the agency spent many hours tweaking its computer system to make sure it could produce the statistics needed for the federal reports without leaving blanks. For instance, New Hampshire reported it takes an average of 13 hours to begin an investigation after receiving a report of an abuse, putting it fourth in the nation on a question that Massachusetts left blank. Bishop said the agency also worked with caseworkers and supervisors to ensure they enter the data into the system promptly and correctly. “Over the past seven or eight years, we have spent a lot of time helping social workers understand and utilize the value of the data,” Bishop said. In the aftermath of Jeremiah Oliver’s disappearance, however, some Massachusetts supervisors have drastically increased their attention to data, printing out caseworker visit data on a daily basis toward the end of the month. “Now, supervisors know which families have not been visited as the month is coming to a close, and they’re asking the social workers: ‘What’s your plan for seeing these families?’ ” said the Massachusetts manager who asked not to be identified. And Governor Deval Patrick recently ordered technology workers to improve the agency’s systems so workers can file and use timely reports, even when they are out in the field. But DCF has gone through previous cycles of tragedy and reform without rising in the rankings. In 2008, the Legislature changed the agency’s name and revamped the child welfare laws after an 11-year-old Westfield girl was hospitalized with brain injuries after a brutal beating by her adoptive mother, and a 4-year-old girl from Hull was killed by an overdose of drugs. In both cases, the state had previously received reports that the children may have been abused. Despite the changes, critics say the agency continued to lag behind other states in a range of measurements collected by the US government. In 2006, the Foundation for Government Accountabilityranked the state 44th out of 50 states, based on an aggregate of 41 federal statistics. By 2012, Massachusetts had dropped to 50th. “It stands out as being one of the poorest performers” in the nation, said Sara Bartosz, an attorney for New York advocacy group Children’s Rights, which sued the agency in 2010 for failing to do enough to care for foster kids. “It’s a system that is rather unique in finding itself at the bottom of the barrel across a whole range” of measurements. “DCF is spread way too thin. Caseloads are too high. The management structure is depleted,” she added. The agency discounted the criticism, noting that a federal judge last fall rejected the advocacy group’s request for a judge to order changes in the state’s foster care system. But US District Court Judge William G. Young’s ruling in November cited example after example of how the agency was falling short of national benchmarks, including failing to check on children frequently enough — precisely the problem cited in the disappearance of Jeremiah Oliver. The judge also blamed the problems largely on the lack of funding, rather than mismanagement; the agency’s budget fell from a high of $836.5 million in fiscal 2009 to $737.1 million in fiscal 2012. To help ease longstanding concerns about workload among frontline staffers, Patrick last month proposed boosting the department’s budget by $32.6 million, a 4 percent increase. The state said the extra money would help it reduce the caseload from 18 to 15 cases per social worker, fulfilling a previous commitment from the Patrick administration, as well as allowing the agency to better review reports of abuse. But it is not just a lack of resources holding the state back, critics say. Mary Elizabeth Collins, a professor of social welfare policy at Boston University, said she also thought Massachusetts was too hesitant to work with local academic researchers — something the state has in abundance — because it is fearful of being criticized, even though researchers might be able to help identify helpful solutions. “Many in the research community have run into roadblocks trying to engage in partnerships” with DCF, Collins said. Still, Collins and some other researchers questioned whether Massachusetts is really the worst in the nation, as the 2012 report by the Foundation for Government Accountability suggests. David Finkelhor, director of the Crimes Against Children Research Center at the University of New Hampshire, said he thought the national ranking and federal statistics were crude and misleading. He also thought it was a mistake to give Massachusetts a zero in categories where it refused to provide data to the federal government. But Finkelhor said he did not know of any reliable indicator of where Massachusetts stands. Patrick administration officials declined to say where they thought Massachusetts was doing better or worse than its peers, but noted they are making strides to improve. For instance, state officials said nearly 38 percent of foster children are now adopted within two years, up from less than 30 percent four years ago. And fewer foster children are being moved multiple times in the first year of care. “We’ve made significant progress in recent years,” Roche said. Still, critics say the state still has a long way to go. Sean P. Murphy of the Globe staff contributed to this report. Todd Wallack can be reached at twallack@globe.com.